Um, yeah. Way to set a girl up for disappointment. Don’t get me wrong. I didn’t hate it! I just… fail to see how it could be considered THAT good. So, after a little head scratching and soul searching and an entire package of Oreos (no shame), I have compiled a short list of why I think dudes love this movie. 1) Errrrbody is in it. Seriously. Christian Slater (What happened to him anyways?). Patricia Arquette (Swoon). Brad Pitt (Underutilized). Christopher Walken (Always a creep). Dennis Hopper (Like a boss). Gary Oldman (Dread head). Samuel L. Jackson (For 5 seconds). James Gandolfini (R.I.P.). Val Kilmer (Wait. I didn’t see Val in this movie?!). And a whole buncha other peeps who are in a whole buncha other movies that I don’t know by name. 3) Clarence and Alabama are sorta Bonnie and Clyde. They’re so adorable and then, without warning, they are so brutally ruthless. Blood everywhere! Exhibit B: Clarence be trippin’. Exhibit C: Alabama puts on her crazy pants one leg at a time. 4) That one super intense scene. I’ve started having nightmares about Christopher Walken dancing to Fatboy Slim and then shooting me to death. 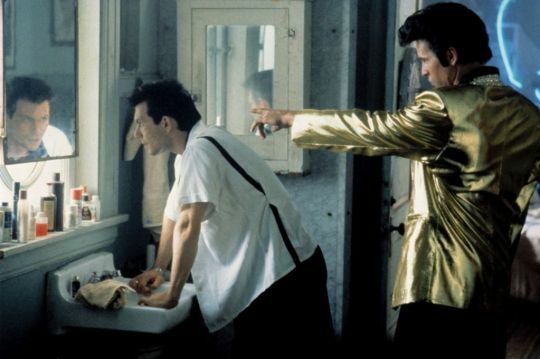 Maybe I have to be a dude to truly appreciate the awesomeness that is “True Romance”. Maybe this movie is just too cool for me. Either way, no regrets. Thanks for the lend, G!